Making your computer more secure is a good idea since there are so many online threats. Plus, hackers and virus/malware programmers are opportunists, and if you are a weak target then they will zero in on you and make you suffer for your lack of Security. Following are Top Seven Ways to Enhance & Increase Computer Security on Windows and Mac operating systems. You can follow these steps to make your computer or laptop more secure from online internet threats. This means creating longer and more complex passwords for your computer. The startup process should have a lock on it where you have to enter a password in order to gain access to your profile. The password strength should be long and complex, but that is not where you should stop. You can set up passwords for sensitive files and you can even install software that locks up other programs on your computer that may contain secret information. This is a good idea because you cannot tell what is going to happen tomorrow or the day after. You cannot be sure that your computer will not crash, get a virus or have its memory wiped. If you back up your data then you have something to fall back on if things go very bad. 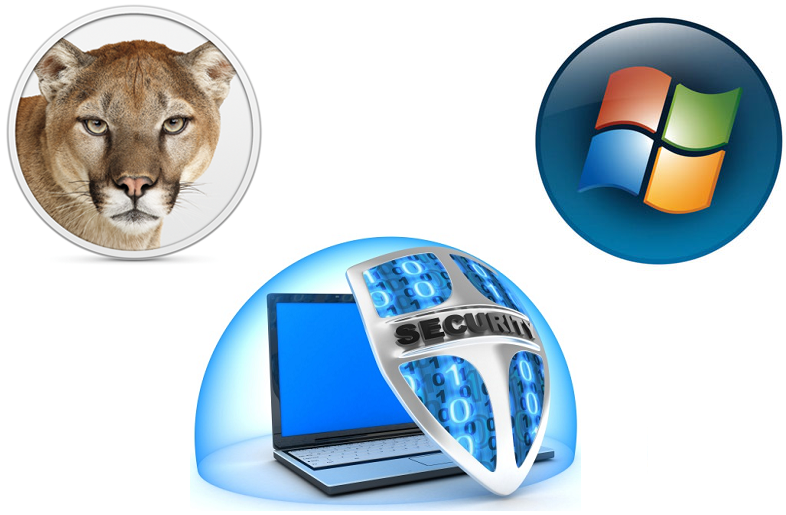 A good one should be able to stop viruses, malware, trojans, worms, etc. It should check your downloads against the community of other users to see if others have had problems with it in the past. It should block websites from attacking your computer and it should have regular updates sent through to be sure you are getting the most up to date protection. You yourself should be careful about what you download and install on your computer and you should work hard to check the safety and security of downloads. A good virus checker should be updating almost daily in order to catch new threats. Your Anti-Virus checker should be allowed to run scans on its own, without prompting, and should allow you to manually start a virus scan. The ones that allow you to scan individual folders is good too if you have just done a little downloading and you do not want to wait for a full system scan to complete (it is just more convenient). If you have something such as Windows ME, 98, XP, Vista etc, then you should update to Windows 7 (the XP replacement) or Windows 8 or Windows 8.1. The newer ones are more stable and less open to attack by others. Your Internet browsers should also be updated as this will offer similar protection too. There are times when things such as a new browser may have bugs, in which case you may like to leave it a little longer before updating, but do not leave it too long or you risk a hacker coming across you and hacking your system. Newer versions of software are supposed to be set up so that they are more secure for the users. If you have Windows then it should be able to automatically download and update on its own. It is possible to turn this off, and you should make sure you do not. It is there to update your operating system as Microsoft updates things. They send out updates on things such as security in order to deal with the newest threats. If you are not allowing your computer to update itself over time, then you are leaving yourself open to security threats for longer than you should be. There is lots of software on your computer that is so popular that hackers spend their time finding ways to hack it. Things such as your Office program, Adobe, etc, may be more vulnerable to attack unless you update them for time to time. Things such as security updates should be free. If you have software that you use often, then it is a good idea to see if it has an auto-update function or if you can download and install updates on a regular basis. You should set up a profile for each computer user. You should be the only person that is able to gain access to the administrator side of your PC / Laptop. You should be wary of what people are able to install on your computer.